New Years Resolutions - 1 month down, how are we doing? January draws to a close this week, and we are super-excited about 2019, right? At least that’s what we said a month ago; so now it’s time for a progress report. Vector check. Monthly review. Self-assessment. Call it what you want, but reviewing status is a no-brainer, especially when it comes to business goals. Tom Sands, here - your friendly Client Relations Manager at Envision Design. Maybe it’s just the career Army guy in me, but protection is ALWAYS critical. From an outpost of 1 Soldier doing daytime duty at the front gate of “Camp Swampy,” USA, to a Corps of over 60,000 people deployed for months (or years) of combat operations - and all points in between - it always starts with security. We protect ourselves first, make sure we can communicate second, and then take care of myriad priorities of work from there. I have found the business world to be no different. If money or information is exchanging hands, external forces seem to be ready to pounce. They want to catch a free ride; and they are looking for an easy chance to intercept some, all, or even MORE than just the transactional amount. Treasure troves have been released by simple, small vulnerabilities. Look at the Target breach of millions of customers’ data - it occurred largely because the Heating Ventilation Air Conditioning (HVAC) log-in was simple, AND it was on the same network as the financial data. I’ll bet the Target leadership did NOT have the New Years Resolution to ensure they had heightened security in 2013. That said, after the November incident, we can all be assured that their 2014 resolution included a healthy dose of security upgrades. Heading into February, our Envision Design newsletter will hit the streets in a week. Along with it is the monthly free report, “The 7 Most Critical IT Security Protections Every Business Must Have In Place NOW To Protect Themselves From Cybercrime, Data Breaches And Hacker Attacks.” Truth be told, none of our clients are the size of Target; but we treat each one with the same level (or an even HIGHER level) of respect in terms of securing, monitoring, protecting, backing up, taking actions against threats, and preparing to recover their data. At the beginning of the 2d month of 2019 would be a perfect time to review the 7 Protections checklist. Reflect. Assess. Take action. Our clients went into business to help people, to follow their passions, and to make money in the process. We aim to have them ALL on board when we roll into 2020, so we work hard during the day to stay ahead of threats - learning, studying, training, monitoring, watching for anomalies or intrusion - and we sleep well at night, assured that the systems are in place to make all of that happen 24-7. It’s like being in the Army, again - we are on duty all the time. Contact us any time - email help@envisiondesign.net or or call 832-442-8588. See where your business stands. Fill out a basic 20-question checklist; take our survey, and let us help you bring your vision for your business into focus. Click the image above to visit our internal page. We will contact you to review your results. I am me, me I am. Envision Design is the only certified member of the Apple Consultants Network that has been helping Houston businesses manage, monitor, and secure technology systems for over 25 years. We retain clients by providing outstanding customer service rather than locking them into long term contracts. Fluent in both Apple and Microsoft solutions, we ensure your critical data has been backed up and is protected with a disaster recovery plan in our hurricane-prone area. Whether you need to comply with industry mandated security requirements like HIPAA, you want to implement a backup and disaster recover plan in hurricane prone Houston, or simply want to improve the productivity of your team, Envision will help you get on with the great work YOU want to do. As your technology consulting partner and trusted advisor, we are here to help. Please call or email us any time. 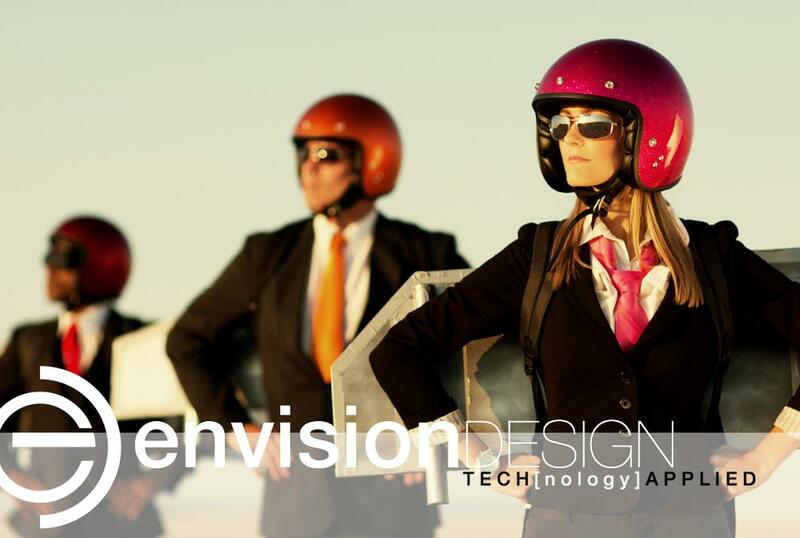 At Envision Design, we understand that technology for its own sake is not a solution. And although we are technically trained and certified, we know our job is to listen to you, come to understand your business, and then to apply our knowledge, training, and expertise to meet your unique needs. As technology consultants, our goal is to partner with you to help you and your team become more productive and profitable. We apply technology to solve problems. We maintain our training and certifications with key partners like Apple, Microsoft, Barracuda Networks, Ubiquity Networks, Synology, & JAMF to ensure our clients access to some of the best business solutions available today. We’re not just “IT people” or “break-and-fix guys”. We’re idea people and business consultants with an expertise in Apple systems and technology integration. We will help ease your anxieties, eliminate your frustrations, and solve your problems. If there’s an issue, we figure it out. If there’s an opportunity, we help you jump on it. And when you need us – whenever, for whatever reason – we’re there.